We hope all our Utah friends had a wonderful 24th of July celebrating Pioneer Day! 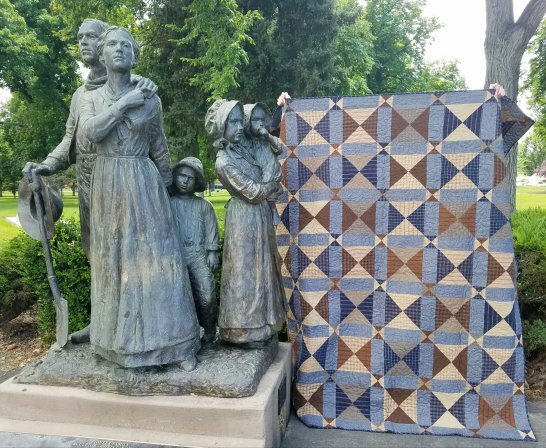 Is it strange that whenever I imagine my own pioneer heritage, there is always a quilt in the picture? My great, great, great grandmother traveled in one of the handcart companies that made the trek to the Salk Lake Valley and was stranded for a time through a harsh winter storm. I think of them wrapped in the quilts made by hand and wonder at the comfort they may have given in a serious time of need. 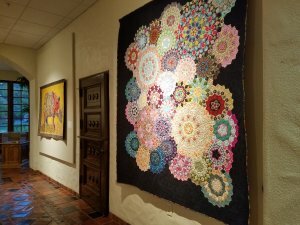 It warms my heart and motivates me to make more quilts with the hope they will bring comfort. "Where we love is home – home that our feet may leave, but not our hearts. It’s not a place but a feeling... comfortable, safe and familiar. 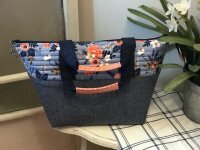 Are you looking the perfect sewing retreat bag? This fun tote bag is for you! 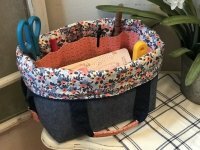 A full open top zipper makes for easy access to all your sewing tools. The best feature about this bag is that it rolls down from the top making the tool pockets easy to reach. 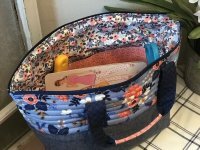 This bag would also be great for toiletries, kids collections, on the go sewing projects… I love a bag with so many options, don’t you? $40 class fee. Pattern and supplies must be purchased separately. Pot luck lunch during class! 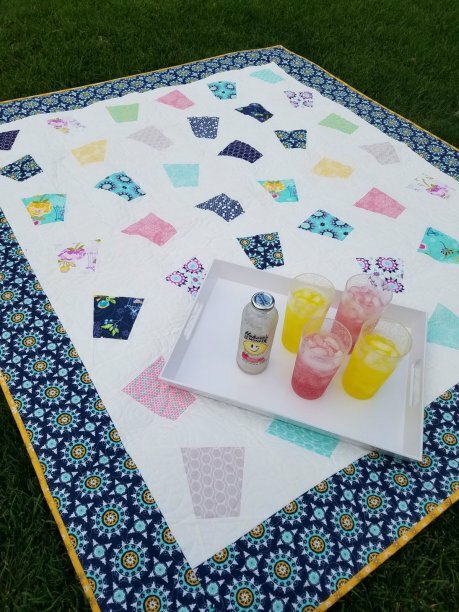 Serve up an ice cold <insert beverage of your choice> at your end-of-summer picnic and enjoy it with this adorable Tipsy Tumbler Quilt! Kathy Kendall will show you how quick and easy this quilt goes together using a charm pack (5" squares) and background fabric of your choice. Choose the size you want to make from Missouri Star Quilt Co's pattern, add a border and you'll be ready to party! Don't worry, Kathy, I didn't tipsy any of these tumblers while photographing your cute quilt. $20 class fee. July 30th - 25% off regular price BOOKS & PATTERNS! Select books and patterns (look for the red dots in our bargain basement) are 50% off!! !